Over the last decade, the rise in crowdfunding has transformed the fundraising experience. It seems almost daily you learn about other nonprofits that have used crowdfunding to surpass their campaign goals. This might have even inspired you to undertake a crowdfunding campaign of your own. Whether you’re interested in how crowdfunding can help your nonprofit or you’re looking to revolutionize your crowdfunding campaign, you’ve come to the right place. Chris Charlesworth, CEO and co-founder of HiveWire, joined us for June’s Toronto Net Tuesday event to share his expertise on nonprofit crowdfunding initiatives and provide insight on HiveWire’s latest work, the Crowdfunding Guide for Nonprofits and Charities. If you weren’t able to attend this session of Toronto Net Tuesday or just wanted to better understand crowdfunding, this blog post summarizes the key takeaways from the event. You can also watch the event recording on TechSoup Canada’s YouTube channel here and check out Chris’ slides on SlideShare here. Crowdfunding is essentially what it sounds like - it’s the process of funding a project or venture by raising small amounts of money (funds) from a large number of people (crowds), usually with the aid of the Internet. The main thing to takeaway is that crowdfunding is an essential tool for online fundraising. After interfacing with a number of organizations, holding workshops, executing surveys and working tirelessly, Chris and his team at Hivewire released the crowdfunding guide, using information from a database of over half a million crowdfunding campaigns. 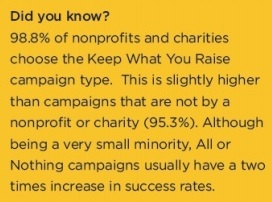 The guide, Crowdfunding Guide for Nonprofits and Charities, outlines a number of steps to help you execute an out-of-the-park campaign. Chris explained that as you begin to plan your campaign you are going to choose between two kinds of crowdfunding. There’s rewards-based crowdfunding (think of it as the “what’s in it for me” approach) and donation-based crowdfunding (essentially a straight donation). Now of these two crowdfunding methods, which do you think is more successful? If you guessed rewards-based crowdfunding, then you are correct! According to Hivewire’s research, the number of contributions for rewards-based crowdfunding is considerably higher. That’s not to say a donations-based campaign cannot be successful, but it does reveal that people are more likely to contribute to a campaign when they find value in what they are getting back, which brings us to the next step. 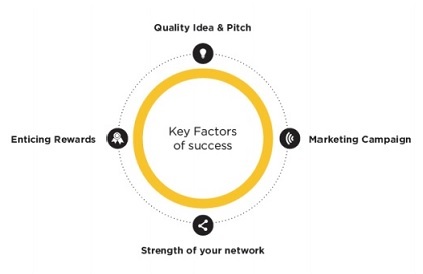 This is the step where you have the opportunity to add the wow factor to your campaign. You can make your campaign stand out by better understanding why others contribute to your campaign and appealing to the needs of your target audience. Think of this as customer segmentation - separate individuals into groups, identify their shared values and incorporate these into the campaign. With so many rewards options , from giving recognition (ex. via a tweet), to providing VIP/backstage access to your event or facilities, to offering a different experience individuals would not otherwise have access to, you need to provide value that appeals to your supporters. Chris explained there’s a 22% increase in the success rate of rewards-based campaigns that offer valuable experiences. Once you’ve laid out the main areas of your campaign, it’s time to test it out. Chris heavily emphasized the importance of this step because it has a strong correlation to the success 0f your crowdfunding campaign and how often testing is overlooked. Chris explained that you can go through the iterative testing process by testing with mini focus groups for feedback and/or testing concepts live on the web to see what traction and interest you receive. Strive to optimize your campaign by testing on your particular target audience. Chris went on to explain that testing can make the difference between a middling campaign and an extremely profitable campaign. After you’ve tested out your campaign and made the necessary tweaks and adjustments, you can begin your marketing initiatives. This step involves significant planning and preparation, so be sure you budget enough time to get organized. You also need to build your network of supporters in advance then prepare your networks for the campaign. This is also the stage where you establish a communications plan. Chris explained that this helps to coordinate your messaging for the campaign. You also want to optimize your marketing by conducting market segmentation, and managing social media and customer service. At this point you might even want to conduct another round of testing. Once you’ve finished prepping and feel comfortable with your campaign, it’s time to execute! Listen - Checking social media channels, Google, email accounts, and your campaign page to stay up-to-date with the online conversation about your efforts. Review - Examine your campaign strategy, timeline and upcoming campaign events. Decide - Do you need to change or adapt your strategy based on the above steps? Execute - Continue to execute your planned campaign steps. Send out additional emails and social media messages. Plan - Identify new opportunities or efforts that will help you reach your goal. You’ve done it! You successfully planned and executed your campaign, but now what? Often times, people think all the work is done at this point, but what they don’t realize is post-campaign activities are just as important to the previous crowdfunding campaign phases/steps. In his presentation, Chris outlined four important post-campaign activities. First off was reward fulfillment, that is, if you offered rewards to donors in your campaign you should make sure they are sent to recipients as soon as possible. Factors to keep in mind are shipping costs, delivery timelines and timely status updates from you to your contributors. Also, after the campaign you need to follow-up and communicate appropriate thank you messages. From donors to campaign backers to supporters and volunteers, it’s important to recognize each of their services and efforts. When thanking donors for their support, be sure to share news about the success of the campaign. If there was a hiccup in your campaign and you did not meet your goals or if there were some unforeseen changes, be honest and enlist the crowd to help you solve the issue. It’s important to manage expectations by being transparent with your supporters, to earn their continued trust and loyalty. Finally, you should nurture new relationships. New individuals who supported your campaign are an opportunity to create meaningful and lasting connections. Chris explained that these supporters could help you out in the future as backers, partners, clients, volunteers, sponsors, etc. On behalf of Chris, his team at HiveWire, and our team at TechSoup Canada, we hope that we helped to further your knowledge on crowdfunding and to develop key strategies for your crowdfunding campaign.